A stark set of infographics breaks down what we know about government censorship of the Internet. Egypt’s Internet may be back on, but that country’s weeklong web blackout was a wake-up call to the rest of the world about just how fragile the intertubes really are. Ars Technica has a detailed technical breakdown of how Internet “kill switches” work— in Egypt’s case, it was basically just a matter of cracking down on the country’s four major ISPs — but for an at-a-glance visual distillation of the who/what/why of web censorship, it’s hard to beat this sobering set of infographics. First, who’s doing it? 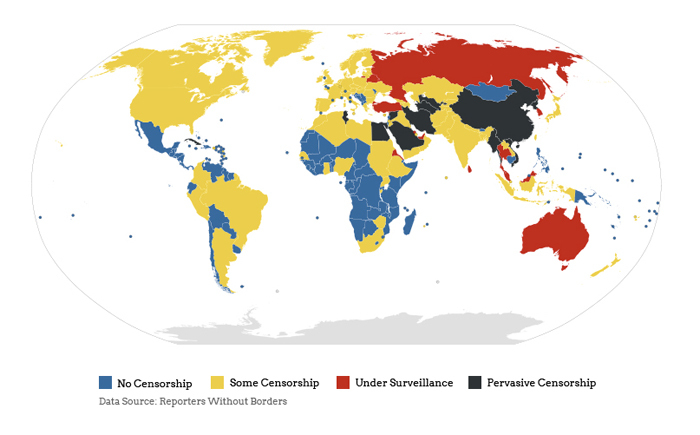 The above map, based on data from the press-freedom watchdogs at Reporters Without Borders, paints a grim picture: Almost all of the industrialized “first world” Internet is moderately to pervasively censored by government authorities. There are obvious and practical reasons for having some online surveillance, but the fact that only countries like Mongolia and Madagascar have a completely open web is rather shocking to see illustrated so starkly. After a strong start, the infographics are interesting but a bit shaky, as seen in the chart above. Using circles to compare data is tricky enough to do correctly (see example #6 here), but even assuming their geometry is correct, the percentages are a bit tricky. Here, we seem to be talking about percentages of the entire universe of censored items. This, it’s not that 20% of all blogs in existence actually being censored, but rather than blogs make up 20% of all censored content. It probably would have been better to show all those dots as pieces of a whole. That said, there’s no harm in whipping together a pretty-darn-good visual snapshot of the state of global web censorship while the subject happens to be hot in people’s Twitter feeds. So bravo, Yuxiyou.net! Next time, let’s get more info on sources after you’re done with Adobe Illustrator.